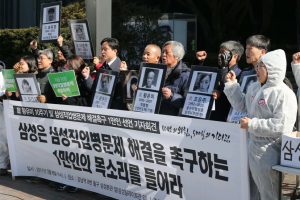 After over a thousand days of sit-in, Samsung workers in South Korea have won a pledge from the giant electronics firm to address longstanding concerns about the company’s abysmal health and safety record. The campaigning group SHARPS (Supporters for the Health And Rights of People in the Semiconductor industry) which led the struggle signed an agreement with Samsung on 24 July under which a third-party mediation committee will produce an arbitration proposal by October concerning the issue of occupational disease clusters detected around Samsung plants. Research by SHARPS has revealed how exposure to toxic chemicals has been making workers sick for years, but until now the company has refused to acknowledge the scale of the problem. By June this year, SHARPS had profiled 320 victims of Samsung’s cluster, of whom 118 had already died. This apparent retreat by Samsung, won after a long and bitter struggle, may in part be motivated by the company’s urgent need to be seen to be cleaning up its act, after the vice chair of Samsung, Lee Jae-yong, was recently dragged through the courts and in and out of gaol on corruption charges relating to the disgraced former president, Park Geun-hye. Workers will be well-advised to go through any arbitration proposal that emerges from mediation with a fine-tooth comb, long acquainted as they are with the company’s cynical and callous disregard for workers’ rights.